Best Season: March – May, Sept. – Dec. The langtang valley trek is one of the most popular trekking routes in Nepal. After Annapurna and Everest region most of the tourists love to be at this site. It is easily accessible to Kathmandu that links Nepal’s Northern border with Tibet, China. This trekking route offers all the mountainous adventure and culture as it is home of some of the highest mountains in the world comprising legendry Sherpa dwellings down the line. Langtang Valley lies just about 130 km north of the Kathmandu Valley. In Langtang region tourist can experience trekking in exhilarating scenery of soaring peaks, glaciers and ancient monasteries. The people living in the highlands of the Langtang Valley are certainly Nepalese but being the descendant of the Tibetan origin, they look like the Tibetans. Moreover, accompanying with the varieties of rhododendron, bamboo forests, majestic waterfalls, and the snow-capped Himalayas make the trek one of the most diverse treks nearby Kathmandu. Arrival in Kathmandu (1,310m). Tribhuwan International Airport and transfer to Hotel in Kathmandu. Drive from Kathmandu to Syabru Bensi (1,450m) 8hrs by local Bus over night at Tea-house. Trek from Syabru Bensi to Lama Hotel (2,480m) 5-6hrs trek, over night at Tea-house . Trek from Lama Hotel to Langtang (3,541m) 5-6hrstrek, over night at Tea-house . Trek from Langtang valley to Kyanjing Gompa (3,900m) 5-6hrs trek, over night at Tea-house . Kyingjing Gompa trek to Lama Hotel (2,480m) trek 5-6hrs, over night at Tea-house . Trek from Lama Hotel to Syabrubesi (2,200m)trek5-6hrs, over night at Tea-house . Drive to Kathmandu by Local bus over night at Hotel on BB plan. Departure from Kathmandu to your onward destinatio. * 3 meals per day during the trek (Breakfast Lunch Dinner) including Tea or coffee. * Accommodation on Tea House. * An English speaking Trekking Guide. 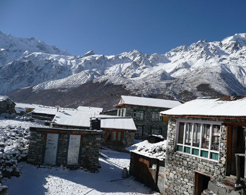 * Langtang National park Fees. * (TIMS)Trekkers information Management System. * Guide and porter salary, Accommodation, food, insurance during the trekking. * Nepal Visa fee (bring accurate USD cash and two passport photographs). * International airfare to and from Kathmandu. * Extra night accommodation/s in Kathmandu because of early arrival, late departure, early return from the mountain(due to any reason) than the scheduled itinerary. * Lunch and evening meals in Kathmandu(and also in the case you return early from the mountain than the scheduled itinerary). * Travel and rescue insurance. * Personal expenses (phone calls, laundry, bar bills, battery recharge, extra porters, bottle or boiled water, shower etc). * Tips for guides and porters.